Hello and welcome all you rad people. 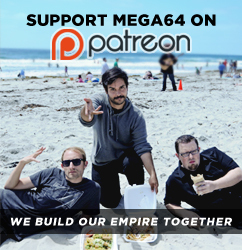 In this episode of the Mega64 Podcast: We are joined by our friends from Funimation! Justin Rojas and Lauren Moore! We talk for a VERY long time about Anime, Anime box sets, Uncharted 4, Bloodborne, Meth in burritos, and is Dragonball AF real? You have to watch to find out! Click here for the audio version! Make sure you come back Friday to check out our new merch! See you then!